Every year on the first day of school, my brother, my dog, and I posed for the camera. Early in the morning before heading to the bus stop, we went outside with our backpacks already on, held up our fingers to demonstrate the grade we were each entering (4 fingers = 4th grade…the dog refrained from this part), and smiled as my parents took our picture to commemorate the day. To me, the photo signified the beginning of a new year, and I remember the pride we took in the outfits we had chosen for that first day and the worry we felt about the unknowns of our new teachers and routines. This annual photo op always took place in the backyard in front of our small family garden. Usually by September, the bed was in full swing – tomato plants too heavy for their own height, zinnias reaching higher and higher for the sun, and a jungle of basil fending off the native army of mint. While simple, it reliably produced ingredients for our summer cooking needs. My favorite warm weather food was my mom’s pesto. I remember smelling the basil as I rode my bike up our driveway on my way home from our local swim club and running into the kitchen to see the pesto in the making. My mom’s version is creamier, nuttier, and more garlicky than the traditional Italian type. With only a few ingredients and 2 steps (blend, add oil), it was ready in a snap. The most difficult part was knowing how much oil to add; the sole instruction was to slowly add the oil to the spinning food processor until the pesto looked ‘right,’ which I learned meant smooth, not too stiff, and not too runny. Over the years, I graduated from watching to helping. First picking the basil from the garden, then measuring out the cheese, and, finally, pouring in the olive oil myself. After our recent homemade pizza adventure, Palate Guy and I were left with a big bunch of basil. Even though it was the middle of winter, I decided to revive the pesto recipe and test out our new food processor. 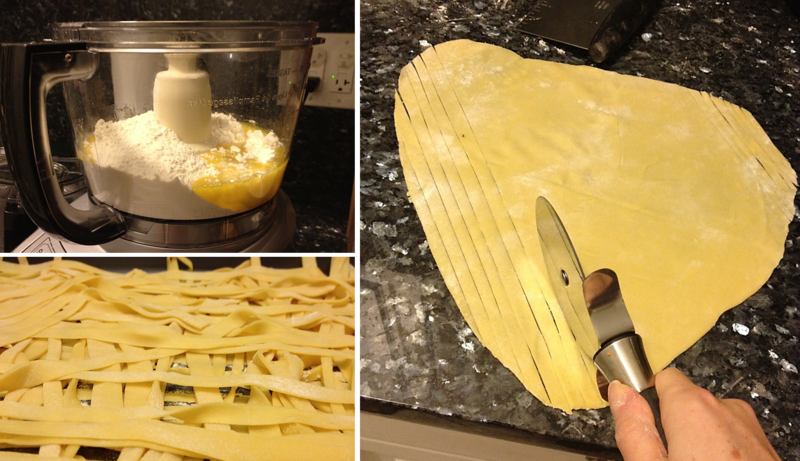 One thing led to another, and before we knew it, we were rolling out fresh pasta too. Since then, we’ve purchased a basil plant – as ‘backyard garden’ as our Brooklyn apartment will get! 1. Combine basil, garlic, parmesan, butter, and walnuts in food processor. Blend. 2. While blending, add oil gradually until desired consistency is achieved (I go for a smooth spread-like consistency, not runny). Salt to taste. Can be made in food processor or kneading by hand. 1. Combine 2 cups flour, eggs, and oil in a food processor. Mix until dough is evenly moist and crumbly (only a handful of seconds). 2. Add flour as needed to adjust consistency: process until dough comes together in a loose ball and feels moist but not sticky. 3. Knead dough by hand for about 2 minutes then put under an upside down bowl to rest for 30 minutes. 4. Divide the dough into 4 parts. Roll each as thinly as possible (approximately 1/16 of an inch) and let rest on a lightly floured baking sheet for 10-20 minutes. 5. Cut into strips with a pasta machine or by hand. Let strands dry for 10-20 minutes. 6. Boil for 1 1/2 minutes or until al dente. Let me know how it turns out! It will be even better once summer rolls around and the basil is local. These days I skip the butter, adding more olive oil instead to get the consistency I want. Saves having to melt the butter and clean another saucepan, and its healthier. Aha – I was actually wondering about that. I didn’t recall using butter growing up, but we followed the recipe as in your cookbook. Good to know for next time. These days, I also use more garlic, maybe the equivalent of 5 cloves or so.